Included: Tour to Tiwanaku (private transport, tour guide, entrance fee, lunch) + hotel. MID-DAY – Arrival to Copacabana (approximate arrival) with accommodation in the selected hotel. PM – We will have about a 2-hour visit to Copacabana; we will visit the Sanctuary of the Virgin of Copacabana, the local market – and, afterwards, we will ascend the stairs of the Calvario where we can appreciate the Yatriris, Amautas, Aymara people, and Quechua people who bless and invoke protection to every family. During the middle of the day, we will have lunch. Included: Shared touristic transport from La Paz – Copacabana, Visit to Copacabana, lunch + hotel. AM – After breakfast, we will start our tour to the Island of the Sun (Isla del Sol in Spanish), crossing the lake and arriving to the island approximately 1 hour later. Upon arrival, we will visit the archaeological sites of the religious center, Pilkokaina – the Temple of the Incas; afterwards, we will take a walk through the stairs of Yumani (created literally by the steps of our ancestors) until we reach the sacred Fountain of Youth (called Fuente de la Juventud in Spanish) where it is believed that a drink of sacred water from the fountain can purify one’s body and cause one to regain their youth; within the garden of this fountain, one can enjoy the Inka beauty which is found within. After visiting the island, we will have lunch and then descend to the boat to continue to the Island of the Moon (Isla de la Luna in Spanish). In the northern region of the island, we will find the archaeological site of Iñac Uyu – the designated temple to the cults of the Moon; the temple is also recognized by the name Ajllawasi – or, “House of the Virgins of the Sun.” Afterwards, we will return to Copacabana and then take transportation from Copacabana – La Paz where we will then find accommodation in the selected hotel. Included: Tour to the Island of the Sun + Island of the Moon (shared boat, tour guide, entrance fees, lunch on the island), touristic transport from Copacabana – La Paz + hotel. AM – Personal pickup from your hotel and transport to the La Paz airport. AM – 1-Hour Flight from La Paz – Uyuni. AM – Arrival to the Uyuni airport (approximate arrival) and transfer to our office in Uyuni where you will have free time until we start the expedition. END OF THE AFTERNOON – We will have the opportunity to enjoy a spectacular natural lights show, performed by the setting of the sun when its colorful rays of light dance on the infinite sea of salt; after the magnificent show of lights, we will continue our trip to the villages of Tahua or Colchani to find accommodation in a salt hotel. SALT HOTEL: Provides a hotel room with private bathroom + breakfast. 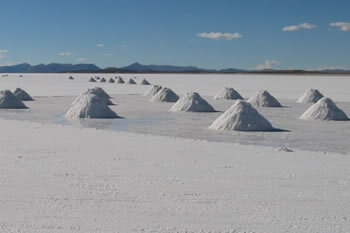 Included: Private transport (4x4 Jeep – Land Cruiser), entrance fees to the Uyuni Salt Flats, lunch and dinner + Salt Hotel. Not Included in the Tour: Snacks; Drinks; Tips for Transport Drivers. NOTE: Please take with you warm clothing, sun glasses, sun block, a camera to take pictures, gloves, warm hats, and towels; likewise, a rain coat during the months of December through March. IMPORTANT: For the expedition to the Uyuni Salt Flats and also to the lagoons, there will be no tour guide due to the fact that the trip is landscapist and there is nothing to explain; the driver will give the necessary information in Spanish. If you would like a tour guide, you may ask us for one, and we will update the pricing as necessary. Without a doubt, the Currency Museum is the most important building in the history of South America’s colonial architecture – its architect/builder was a man by the name of Don Salvador de Villa who had planned and constructed the Currency Museums in Mexico and in Lima, Peru. Interestingly enough, the construction of the museum in Potosí surprisingly came into fruition due to the amount of silver that was found and extracted from Cerro Rico – as well as the growth of population in Potosí, the commercial expansion, and the unawaited boom that came to the city – amongst other factors; these factors created the necessity to organize a center of co-financing in which (after the construction of the center) the coining of currency rapidly began and had continued from 1572 for about 200 years. After the visit, you will have free time to eat lunch on your account – then, in the afternoon, we will continue to the city of Sucre. Upon arrival to Sucre, we will find accommodation in the selected hotel. 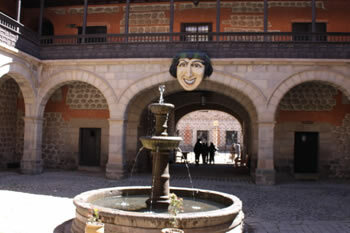 Included: Private transport from Uyuni – Potosí – Sucre, visit to the currency museum + hotel. Without a doubt, the city is one of the most beautiful cities in all of South America with a historical center that still maintains the colonial architecture of past centuries. 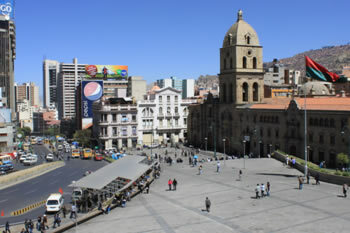 During the city tour, we will visit the charming streets and important places where transcendent works within the pivotal history of Bolivia and all of the Americas have been accomplished; within the streets and important places, one can feel welcomed by the aura and beauty expressed by the neoclassical facades and the magnificent colonial churches – as well as the principal historical monuments. After the visit through the city, you will have free time to eat lunch on your own account. AFTERNOON – We will take private transportation towards the indigenous community of Jatum Yapara (the indigenous nucleus which rescues the values of the Yamparan culture – one of the most antique cultures of the continent) which is located 23 kilometers from the city of Sucre; we will visit the typical houses of the people that live within the community, as well as observe the vibrant colors of their dress, observing also their music and grand variety of textiles. Please note that – if you would like to acquire textiles and/or artisan pieces directly from the sellers – you will be able to do so upon our return to Sucre. Included: City Tour in Sucre + Visit to the Indigenous Community of Yampara (private transport, tour guide, entrance fees) + hotel. AM – At the indicated hour, after breakfast in the hotel, you will be transported from your hotel to the Sucre airport. AM – Approximately a 45-minute flight from Sucre – La Paz; upon arrival, you will be transferred to the selected hotel and then you will have free time until the start of the tour. During the City Tour, you will have the opportunity to learn more about the natural, cultural, historical, and archeological richness of the beautiful city of La Paz, passing through several sites rich in historical value. You'll be visiting: the Plaza Murillo, the Holy Cathedral, the Government Palace, and the Witches Market, in which the local people buy various necessities for the many ritualistic ceremonies in existence in Bolivia - including the ceremonies of Ch'alla and the offerings to Pachamama - "Mother Earth." 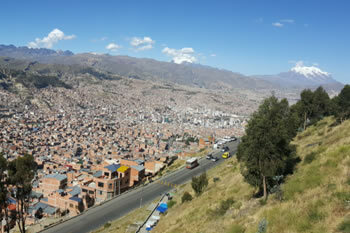 After visiting the urban center of La Paz, you will pass through the Valley of the Moon, visiting also the residential neighborhoods of the Southern zone of the city. Continuing from the Valley of the Moon, we will take a ride on the different cable cars that pass through the city (called teleféricos in Spanish); on this ride, you will see a different perspective of the city as you fly through its skies. Throughout this sky adventure, you'll capture a breathtaking view of the mountain Illimani, the surrounding mountains, and you will also experience the sweet mixture of modernization and tradition - all while the City of Wonders captures your heart, leaving behind an unforgettable experience. We will be taking a ride on the Yellow and Green cable car lines. Included: Transfer out/in, flight ticket from Sucre – La Paz, City Tour + Valley of the Moon + Cable Cars "Yellow – Green” (private touristic transport, tour guide, entrance fees) + hotel.